Avionic displays usually contain a traditional set of data suitable for airplanes. We, however, had a task of creating an air navigation display that would perfectly fit Scout, a light helicopter. Scout doesn’t have a traditional analog instrument panel, this display is all it has. 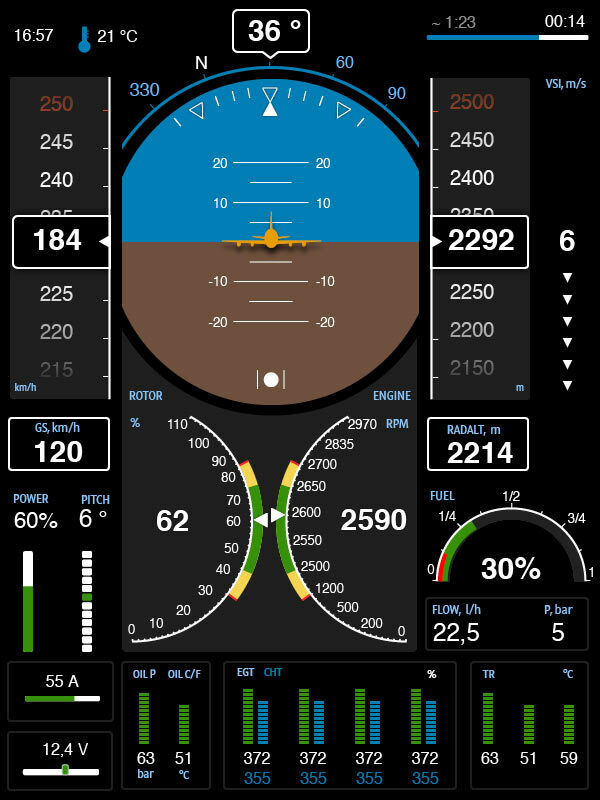 On one hand, it’s important not to overload the display with information, on the other, apart from standard flight data it will display helicopter-specific indicators which are absent on airplane displays. It is important to maintain the recognizable appearance and location of instruments to avoid confusing the pilot. 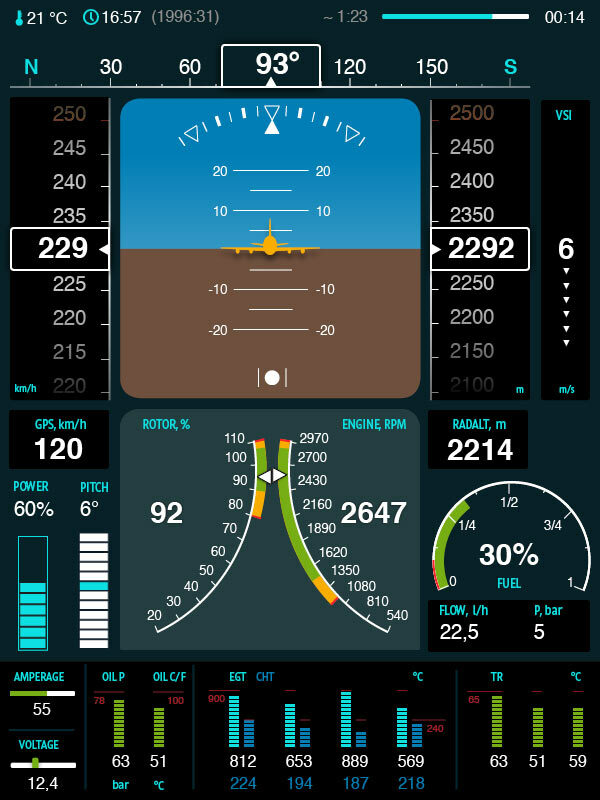 The display not only shows the instruments, it informs the pilot of the status of all the systems in flight. 1. Airspeed, measured in knots, miles per hour or kilometers per hours. Values for Scout range from 0 to 216 km/h. 3. Altitude (barometric, above sea level), measured in feet or meters. Hover ceiling: 2100–2400 meters. 4. Vertical speed, measured in meters per second or feet per minute. For Scout: from 0 to 10 meters per second, autogiration 5,6 meters per second. 6. 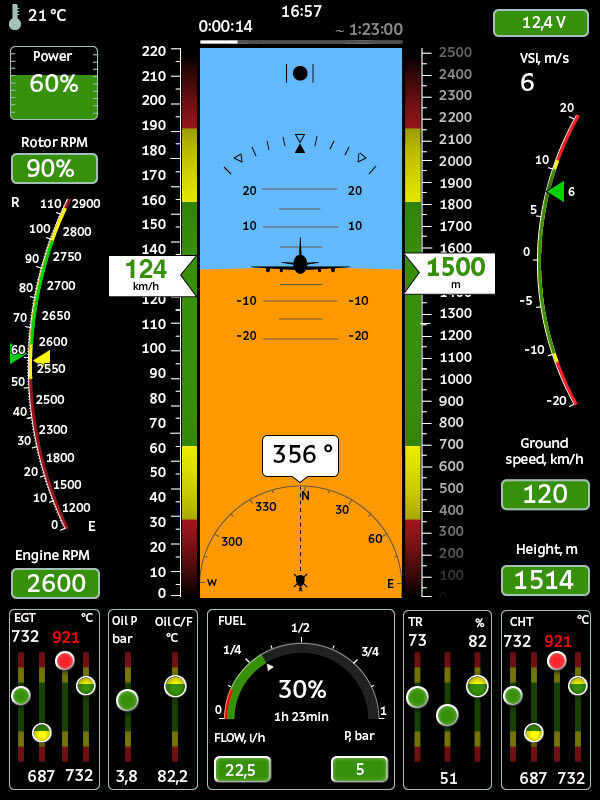 Artificial horizon—pitch and roll angles in degrees. Roll should not exceed 30 degrees in normal, non emergency turns. 7. Compass (classic or ribbon layout). 9. Emergency messages (generator failure, emergency fuel level). Studying the arrangement of indicators on traditional displays. Despite the multitude of display models, they all follow common rules for the location of indicators. 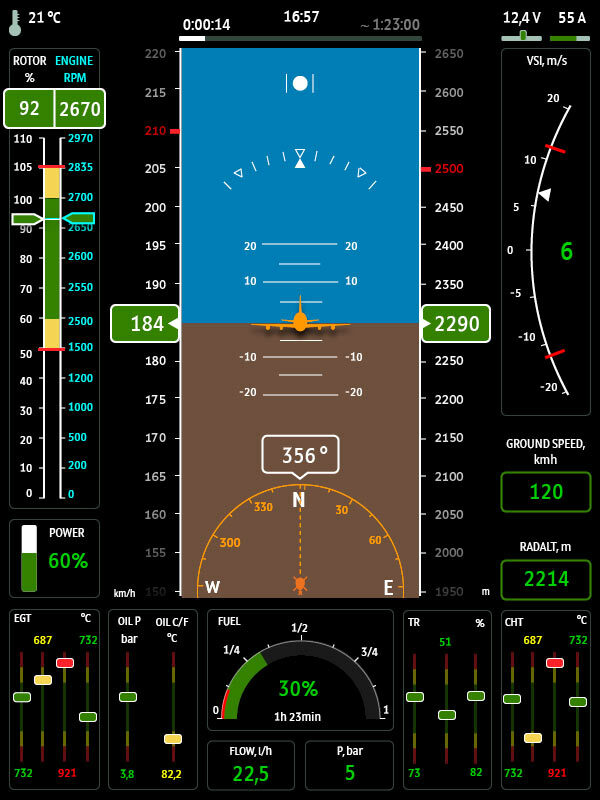 For example, the artificial horizon is located in the center with the airspeed indicator to the left of it and the altitude indicator to the right. Our display is positioned vertically to allow placing two similar screens together (one for instruments, the other one for a map). Creating a diagram of indicator positions. Adding a status bar at the top. A notification panel will appear above it in case of any emergencies. Positioning engine and rotor RPM indicators to the left of the airspeed indicator. Engine indicators are in the lower panel. Realizing that we are missing the fuel gauge and the electrical system voltage indicator. Starting to work on indicator appearance. Coloring the scales: green background denotes safe range, yellow values require attention from the pilot, extreme values are colored red. Trying to add visual accent to make sure that less important information does not obstruct the more important data. For example, making vertical speed indicator larger and the engine power output indicator smaller. On a real screen, the notification panel appears over the status bar, not above it like in the diagram. Updating the drawing. Adding a progress bar indicator for flight time and ETA. ETA is a very rough estimation of course, but can still be helpful. Showing the entire range of possible values on the altitude and airspeed scaled. This will give the pilot additional information in the form of a moving ribbon which will show whether altitude and speed are increasing or decreasing. Increasing the number of engine indicators. Turning the indicators into bars to move the emphasis from a specific number to a range of values. Adding a current level marker which will act as a magnifying glass showing the color of the current sector. 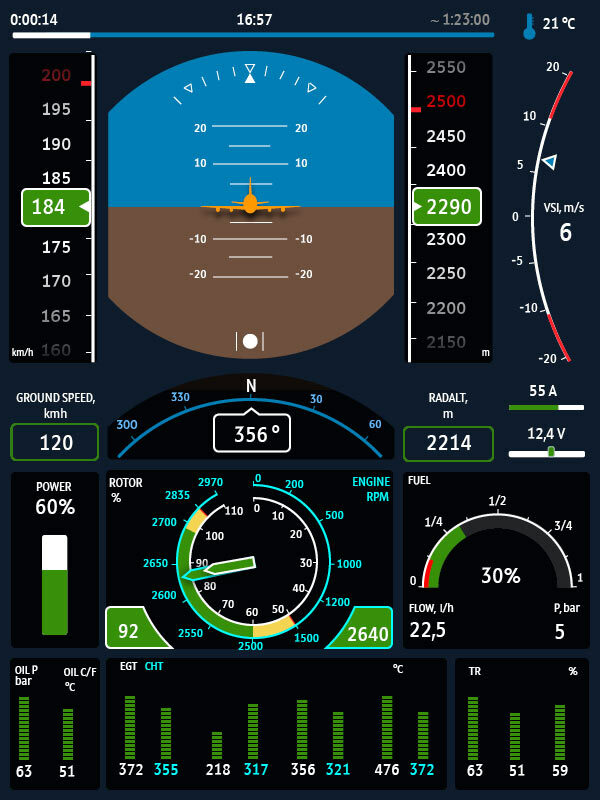 Range boundaries are also visible to allow the pilot to see if the indicator is working properly. Adding number values at the top and at the bottom of the bars. Drawing the tachometer in the shape of a vertical scale. 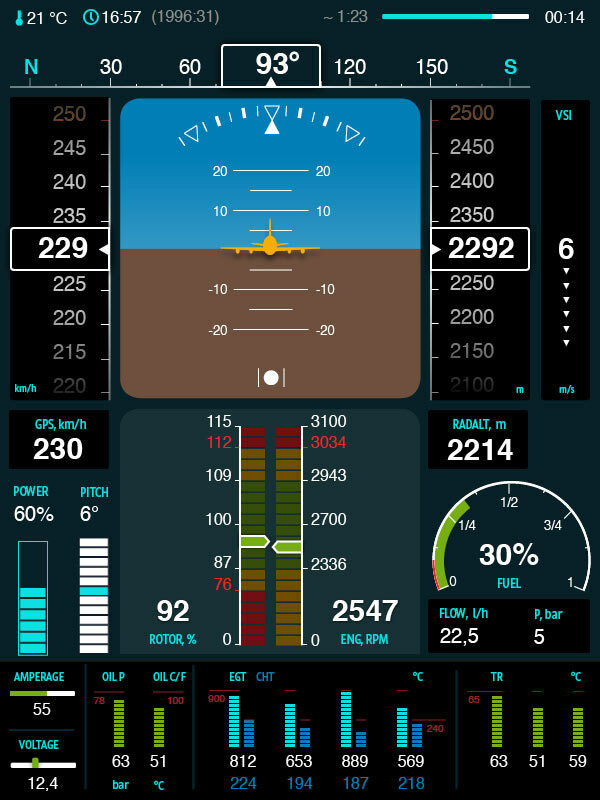 Combining the indicators for engine and rotor RPMs. The pilot has to be able to see that they point to approximately the same point on the scale, which means the helicopter is working properly. Markers on the scales are highlighted in the color of the current range and current values are duplicated with a white line on the color bar. Numerical values are shown above the scale. Color coding of the scales allows the pilot to recognize when the values approach extreme ranges. But right now there’s too much red on the screen even when everything is OK. We want the pilot to be able to instantly see that something isn’t right by seeing red on an otherwise green or yellow screen. Which is why we decide to replace red sectors with limiters on all instruments. Making the airspeed and altitude indicators static with a moving ribbon, as pilots are used to looking at the center of the scale for the current value. Besides, it will allow to make the numbers larger. Now only the main indicators have color accents and their values are in colored frames. This should be convenient as it would allow to find them out at a glance. 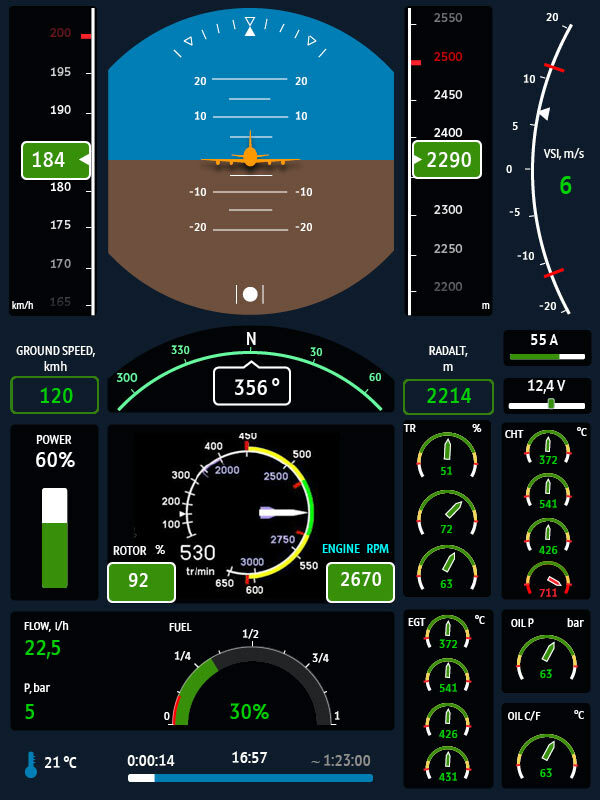 After testing the interface on a display that is realistically positioned relative to the pilot’s eyes, it becomes clear that the text is too small and the lines are too thin. Besides, drawing all the scales as vertical lines makes them appear too similar which further decreases legibility. Deciding to search for inspiration in analog instruments. Scales of many of them are represented as sectors on a circle. The round artificial horizon and the tachometer look OK, but round engine indicators are definitely an overkill. They take up too much space, plus it would be better to put them all together at the bottom of the screen. Reverting to the bar layout but this time using height and color of the bars to show current values. Much better. Fighting to increase the size of numerical values. Placing the compass on top of the horizon, which gives more space to the tachometer. Drawing the tachometer as two diverging arcs that are closest at the most optimal range. Changing the appearance of the vertical speed indicator. Trying to highlight indicators with backgrounds of various colors. The round artificial horizon is familiar to those who normally flies with analog instruments but wastes precious screen space. Instead of empty corners, we can show something meaningful. Going back to the square horizon but this time with rounded corners as a nod to the tradition. The compass becomes linear. Changing the radius of the tachometer arcs to take into account numerical values and ranges specific for Scout. Going back to subdued blue background to make sure indicators stand out better with their black backgrounds. Testing the static display on real-life equipment again to make sure all instruments can be easily read. Writing a detailed interface guide for developers in Russian and English. The display comes to life. 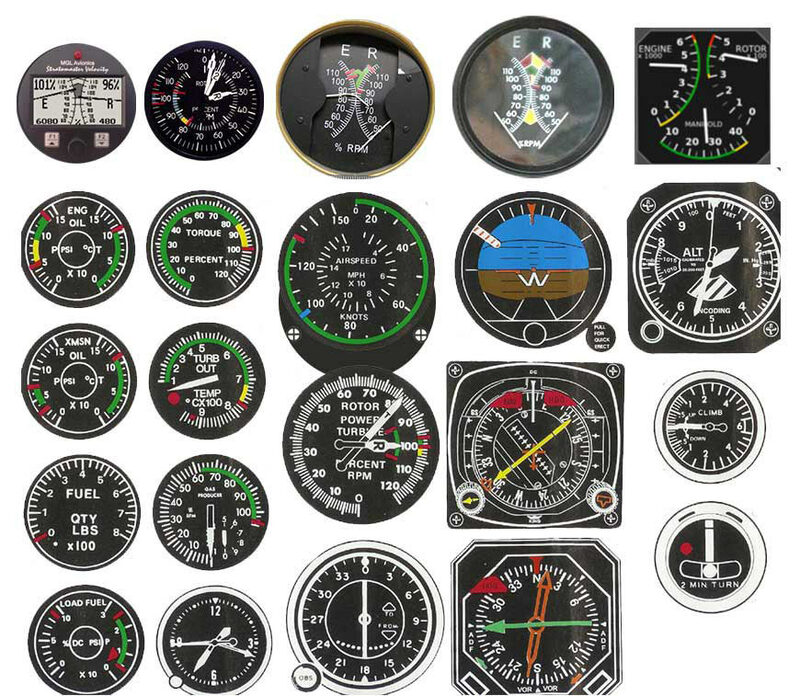 Flight tests reveal that the arc-shaped tachometer is unusual for pilots. They would prefer an analog instrument that has a linear scale with LEDs of various colors that light up based on the current value. Using this instrument as inspiration and finding a suitable way to show the tachometer as two bars. Adding it to the display.